^ "Commission on Presidential Debates announces sites and dates for 2016 general election debates". Commission on Presidential Debates. Archived from the original on October 18, 2015. Retrieved September 23, 2015. ^ a b c d "CPD: 2016 Debates". www.debates.org. Retrieved April 21, 2019. ^ "Election Results". Illinois State Board of Elections. Retrieved December 6, 2016. ^ "Election Results". 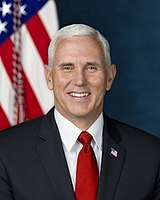 Indiana Secretary of State. December 1, 2016. Retrieved January 12, 2017. 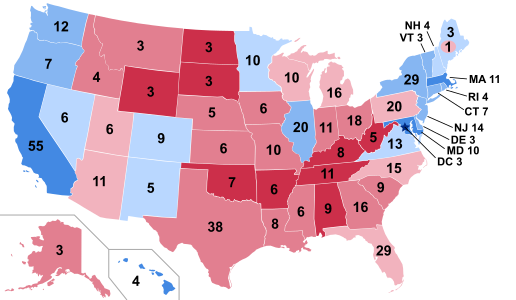 ^ "Federal/Statewide Races". Iowa Secretary of State. December 5, 2016. Archived from the original on December 24, 2016. Retrieved December 10, 2016. ^ "Official Vote Totals" (PDF). Kansas Secretary of State. Retrieved December 1, 2016. ^ "Official 2016 General Election Results" (PDF). Kentucky Secretary of State. Retrieved December 1, 2016. ^ "Louisiana Secretary of State – Official Election Results". Retrieved November 23, 2016. ^ a b "Certificate of Ascertainment of Electors–State of Maine" (PDF). National Archives and Records Administration. Retrieved December 17, 2016. ^ a b "Tabulations for Elections held in 2016". Maine Department of the Secretary of State. Retrieved January 7, 2017. ^ "Official 2016 Presidential General Election results for President and Vice President of the United States". Maryland State Board of Elections. December 9, 2016. Retrieved December 10, 2016. ^ "Electors of President and Vice President" (PDF). Massachusetts Secretary of State. Retrieved December 1, 2016. ^ "Ruth Johnson, Secretary of State – Official Election Results". November 28, 2016. Retrieved November 30, 2016. 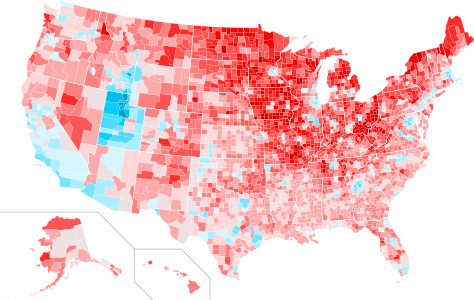 ^ "2016 General Election Results". Minnesota Secretary of State. Retrieved December 1, 2016. ^ "State of Mississippi Certificate of Vote–2016 General Election". Mississippi Secretary of State. November 28, 2016. Retrieved December 31, 2016. ^ "Official Results". Missouri Secretary of State. Retrieved December 13, 2016. ^ "2016 Statewide General Election Canvass" (PDF). Montana Secretary of State. Archived from the original (PDF) on December 20, 2016. Retrieved December 10, 2016. 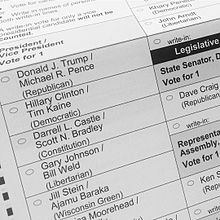 ^ "2016 Statewide Write-In Canvass" (PDF). Montana Secretary of State. Archived from the original (PDF) on December 20, 2016. Retrieved December 10, 2016. 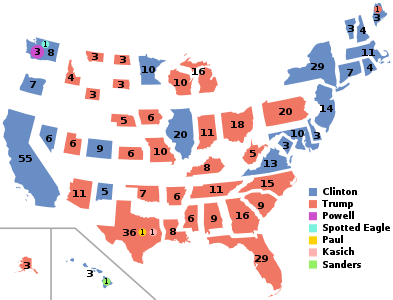 ^ "Silver State Election Night Results". Nevada Secretary of State. Retrieved December 4, 2016. 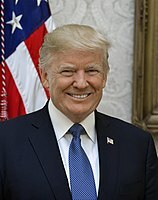 ^ "President of the United States – 2016 General Election". New Hampshire Secretary of State. Retrieved December 2, 2016. ^ "Candidates for President–For General Election 11/08/2016" (PDF). State of New Jersey Department of State. Retrieved December 8, 2016. ^ "Official Results General Election". New Mexico Secretary of State. November 25, 2016. Retrieved December 12, 2016. ^ "New York State General Election Official Results" (PDF). New York State Board of Elections. Retrieved December 25, 2016. ^ "Official General Election Results – Statewide". North Carolina State Board of Elections. Retrieved December 2, 2016. ^ "Official Results General Election – North Dakota". Retrieved November 18, 2016. ^ "Ohio State Election Board – Official Results". Retrieved December 7, 2016. ^ "Oklahoma State Election Board – Official Results". Retrieved November 17, 2016. ^ "November 8, 2016, General Election Abstract of Votes" (PDF). Oregon Secretary of State. Retrieved December 10, 2016. 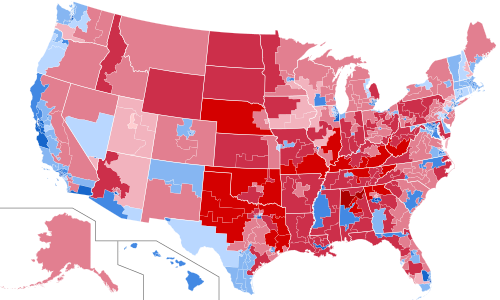 ^ "2016 Presidential Election". Archived from the original on December 21, 2016. Retrieved December 13, 2016. ^ "2016 General Election–Presidential Electors For". State of Rhode Island Board of Elections. Retrieved December 23, 2016. ^ "2016 Statewide General Election – South Carolina". Retrieved November 16, 2016. ^ "South Dakota certificate of ascertainment" (PDF). National archives. Retrieved December 17, 2016. ^ "State of Tennessee November 8, 2016 State General United States President" (PDF). Tennessee Secretary of State. Retrieved December 15, 2016. ^ "Statewide Federal Election Results" (PDF). 2016 General Election – Statewide Canvass. Retrieved January 29, 2017. 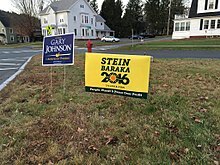 ^ "Vermont US President and Vice President – Official Results". Retrieved November 23, 2016. 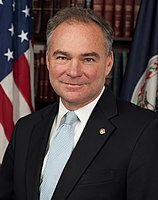 ^ "Virginia President and Vice President – Official Results". Retrieved November 23, 2016. ^ "November 8, 2016 General Election Results" (PDF). FEC Election Results. Retrieved March 23, 2017. ^ "Statewide Results". West Virginia Secretary of State. Archived from the original on December 25, 2016. Retrieved December 7, 2016. ^ "County by County Report" (PDF). WEC Canvass Reporting System. 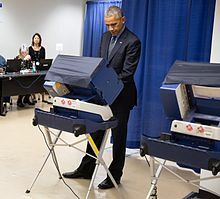 Wisconsin Elections Commission. December 13, 2016. Retrieved December 13, 2016. ^ "Wyoming Official Election Results" (PDF). Retrieved November 16, 2016. ^ "Maine Splits its Electoral Votes for First Time Since 1828". ballot-access.org. ^ "Presidential Election Results: Donald J. Trump Wins". The New York Times. November 9, 2016. Retrieved December 20, 2016. 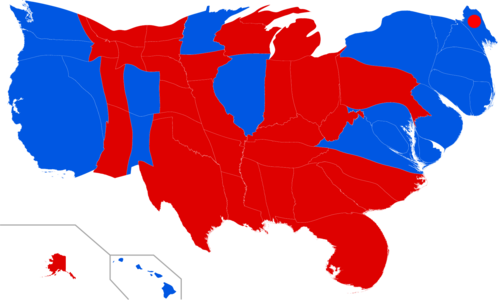 ^ a b "Donald Trump Had A Superior Electoral College Strategy". FiveThirtyEight. February 6, 2017. ^ Hellmann, Jessie (December 19, 2016). "Democratic elector in Hawaii votes for Sanders". Retrieved December 20, 2016. 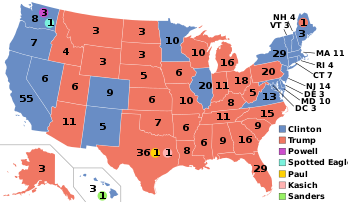 ^ a b Sean Collins Walsh, "All but 2 Texas members of the Electoral College choose Donald Trump," Statesman.com (December 19, 2016). ^ a b "Anti-Trump protests continue across America". The Economist. November 10, 2016. ISSN 0013-0613. Retrieved November 10, 2016. ^ "Gen. Colin Powell Sells His $2.8M Upper West Side Condo". May 24, 2016. ^ "Emails detail Colin Powell's substantial role at City College". ^ "General Colin L. Powell – Informatio". December 20, 2016. ^ Powell has several homes, including one in NYC (still) and also one in DC, but is officially a VA resident per WikiLeaks emails, and per his 'verified' social media account. ^ a b c d Rachel la Corte, "4 Washington state electors to be fined $1,000 for vote," bigstory.ap.org (December 22, 2016). ^ Brunner, Jim (December 19, 2016). "Four Washington state electors break ranks and don't vote for Clinton". The Seattle Times. Retrieved December 20, 2016. ^ "Meet Faith Spotted Eagle, who received one Washington state elector's presidential vote". December 19, 2016. ^ La Corte, Rachel (December 19, 2016). "4 Washington State electors pick candidates other than Clinton". Associated Press. Archived from the original on December 21, 2016. Retrieved December 20, 2016 – via The Olympian. ^ LoBianco, Tom (May 31, 2016). "Poll: Clinton, Trump running tight race in NJ". edition.cnn.com. CNN. Retrieved September 30, 2016. 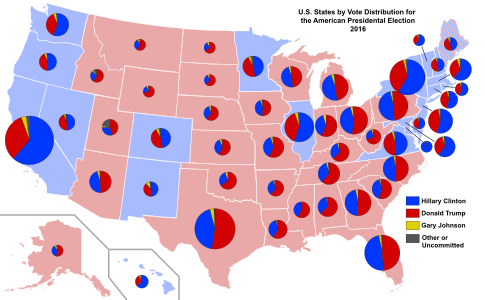 ^ "Larry J. Sabato's Crystal Ball " The Electoral College: The Only Thing That Matters". www.centerforpolitics.org. Retrieved June 11, 2016. ^ "Trump Wouldn't Win Without Polish-Americans. An Interview With William "Bill" Ciosek". November 21, 2016.